Can Hamsters Be Trained? Absolutely! Hamsters make great pets and are a special fun and loving addition to your home. Training your hamster to do certain tricks is a great way to form a better friendship and level of trust. As with any training, it does take some patience and every hamster has its own personality. Some will respond and learn more quickly than others, but with some patience you can certainly train your hamster. Your hamster needs to become familiar with hearing your voice to build trust and familiarity. Always use a calm tone when speaking to your hamster, never shout and avoid loud noises of any kind. Once your hamster is familiar with your voice, he or she will know when you are around and be comfortable hearing you. Hamsters love sunflower seeds, so using seeds as rewards can work well when training your hamster. Make sure the seeds are safe for the hamsters and buy from your local pet store. Also keep in mind that sunflower seeds are high in oil, so use treats in moderation. When you pick up your hamster you need to do it swiftly, with confidence, and without causing any discomfort. If your hamster is running around the cage do not chase down, corner or frighten him away. It can take a little time for a hamster to become comfortable with being handled, so be patient. You will see your hamster starting to trust you over time, making it easier to handle and train your little guy. Like with any training, you need to start off with something simple. 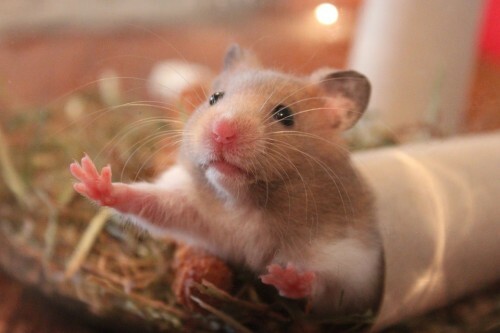 The easiest trick to teach a hamster is training them to stand on command. To do this, just hold a sunflower seed above the hamsters head and with a calm, but firm voice, say “stand”. You will need to repeat this over and over and in time, your hamster will stand! Only give your hamster a treat if he stands on command. In time, he will get that this is the way to get a treat. And then after even more time, you will be able to put you hand there without a treat and your hamster should stand. If you want to teach your hamster to roll over you’ll need to place the sunflower seed on its back side. It doesn’t get much more complicated than that, just keep trying this and rewarding it with a seed if it completes a roll over. Hamsters are able to learn a few different words through repetition. Always try to use the same tone and words when speaking to your hamster and it will react accordingly. Always use encouraging words in a soft and happy tone so your hamster knows that you are happy with his trick. This is another easy trick, just hold the treat just out of reach of your hamster where it would need to jump a little to be able to reach it. Hamsters don’t jump far at the best of times, so be reasonable with the distance. Even if you think your hamster has not mastered a certain trick yet, change up their routine and try a different trick sometimes. You will find that you make overall gains faster by keeping things interesting. It can get a little boring and fattening if you only give your hamster sunflower seeds as treats. Try using small slices of strawberries too or even celery, carrots or apples as treats as a reward for performing tricks correctly. If your hamster isn’t interested or has stopped trying to learn a new trick, stop and come back the next day. Don’t overwork your hamster or he will stop trying altogether. Do remember that tricks are great but they aren’t a substitute for exercise. Make sure your hamster does get exercise by letting him run around or even playing on his wheel. If just brought a hamster home and want to learn the basics, you should read this article: Caring for your new hamster!